Head men’s basketball coach Anthony Monson has plenty to be thankful for. He’s especially grateful for junior James Brooks. The Pratt Community College transfer poured in a career-high 31 points, senior Ithello Cross and junior Nate Leach each added 11 points off the bench, and the Kansas Wesleyan men’s basketball team turned a 13-point deficit into an 86-75 victory inside the Gleason Center at Sterling College. 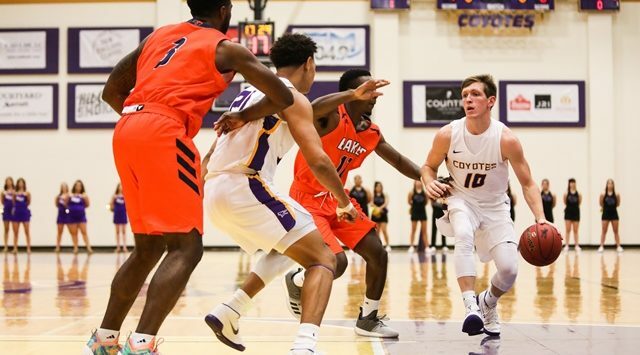 KWU fell behind early after a 6-0 run by the Warriors, but the Coyotes responded with muscle in the paint as sophomore AJ Range scored a career-high eight points in the first eight minutes. Turnovers became an issue, though, preventing Wesleyan from gathering a large cushion. The widest margin was three for KWU with 1:20 remaining in the half. Sterling (1-3, 1-2) didn’t let that stand as the Warriors hit a three at the buzzer, giving them a 41-39 advantage at the break. SC would use that triple to get in an offensive rhythm, recording a 10-0 spurt, keyed by two treys by Isaac Ostrosky. Trailing 58-45, Kansas Wesleyan gave Sterling a taste of its own medicine. Brooks connected on three shots from behind the arc, propelling the Coyotes to a 59-58 lead with 12:46 left after a 14-0 explosion. The Coyotes pulled away for good with an 11-2 burst. Brooks was the Salina Ortho Player of the Game, going 7-of-15 from deep, 12-of-22 from the floor while also pulling down six rebounds. Cross was 4-for-4 with three rebounds in 10 minutes. Leach grabbed two steals and two assists to go with his 11 points. Kansas Wesleyan (3-2, 1-1 KCAC) heads to Colorado next, facing Colorado School of Mines on Friday. Kylah Comley’s season-high 35 points and 20 turnovers were too much to overcome for Kansas Wesleyan. The Coyotes played tough in the first half, only behind 18-14 after one quarter. KWU grabbed its first lead with 7:23 left in the half after a three by senior Valerie Most. The former NAIA All-American in volleyball sparked the Coyotes again in the second, scoring on a drive that put Wesleyan up 33-28 at the 5:07 mark. Sterling (7-0, 3-0) nearly silenced KWU for the remainder of the period, holding KWU to two points the rest of way while putting up 10, jumping out to a 38-35 advantage. Wesleyan kept the contest close, knotting up the score at 48-48 with 4:40 remaining in the third. From there, Sterling used an 18-4 spurt to pull away for a 14-point cushion. Seniors Kayla Kivinski and Sydney Mortensen paced the Coyotes with 12 points each and a combined nine assists. Sophomore Amanda Hill was the Salina Ortho Player of the Game, scoring 11 points and grabbing 11 rebounds off the bench. Wesleyan (3-4, 1-1) gets the rest of the week off before three games next week, starting with a home contest against McPherson on Monday.